We had our first snow this past week. Our cool fall weather dipped below freezing, and we were hit with 6.4″ of heaping snow in one afternoon. With the temperature staying close to the freezing point each day since, that snow is here to stay. Now that winter has finally arrived, it’s time to bust out our favorite seasonal items. We’ll get that fireplace crackling and that hot cocoa made. We’ll bake some delicious cookies and rest on the couch while our favorite winter movies play. For the next few months, we’ll be hibernating indoors, which gives us plenty of time to whip up this fantastic free knitted shawl pattern. 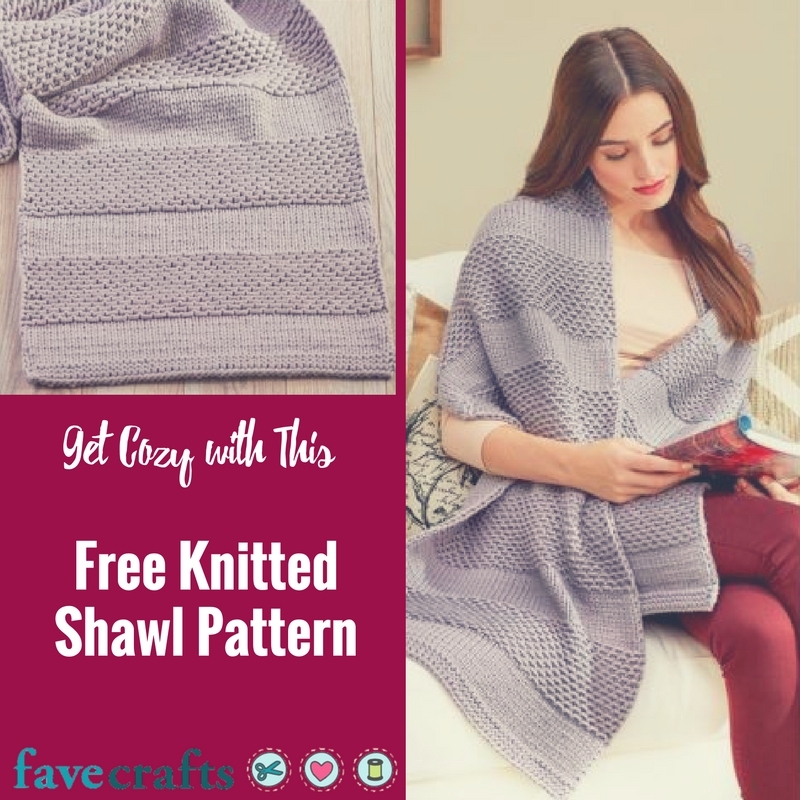 This free knitted shawl pattern is a great project for keeping warm this winter. The yarn is so irresistibly soft and comfortable that you’ll want to drape it around you whenever you can. It’s perfect for reading, watching movies, or curling up with a mug of cocoa on the couch. 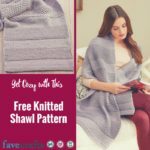 Even better, this free knitted shawl pattern is easy to make, so you’ll have your new favorite winter craft done up in no time! GAUGE: 13 sts = 4″ [10 cm]; 16 rows = 4″ [10 cm] in Stockinette stitch. Finished Size: Shawl measures 17″ [43 cm] wide x 72″ [183 cm] long. Note: Slip first st purlwise and knit last st through back loop of every row for a more finished looking edge. Cast on 58 sts. Knit 5 rows. Rows 3-12: Repeat rows 1-2. Row 14: [K1, slip 1 purlwise with yarn in back] to last 2 sts, k2. Row 16: K2, [slip 1 purlwise with yarn in back, k1] to end of row. Rows 17-40: Repeat rows 13-16. Repeat rows 1-40 for nine more times, then rows 1-12 once. Knit 6 rows. Bind off. cm = centimeters; k = knit; mm = millimeters; st(s) = stitch(es); [ ] = work directions in brackets the number of times specified. Looking for more amazing knitting patterns that will keep you cozy this winter? Check out this Extra Chunky Gratitude Blanket. What are some of your favorite knitting patterns for winter? Learning to knit can be tough, so it’s best to start out with some easy knitting projects. 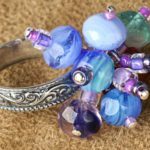 All the better if those easy projects work up super quickly so that you don’t get bored or frustrated with your current project and stop knitting altogether! 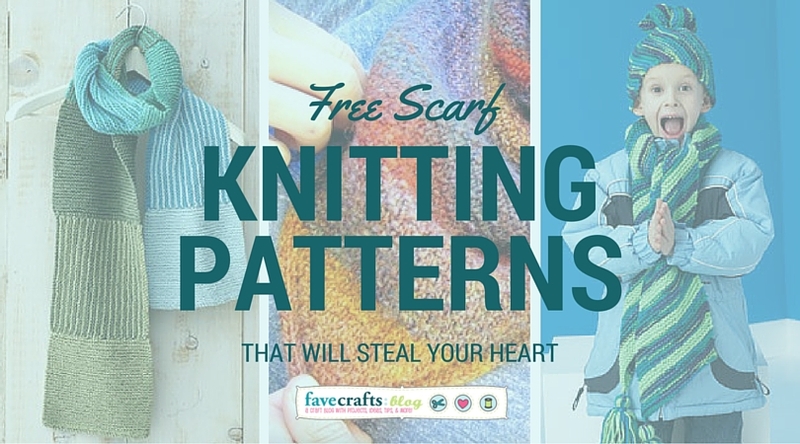 These free knitting patterns are some of our quickest and easiest knitting patterns, so they’re ideal for anyone who is just learning to knit or anyone who is a more advanced knitter but wants a quick, mindless pattern. Scarf knitting patterns are a great place to start if you are new to knitting because they work up relatively quickly and are simple to make. 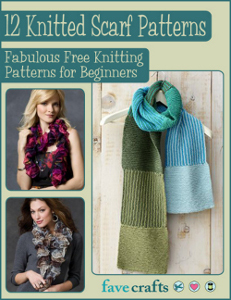 These scarf, cowl, and infinity scarf patterns are all perfect for beginners, casual knitters, or anyone who is just looking for a quick knit. 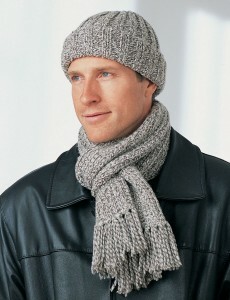 Any beginning knitter needs a quick and easy hat knitting pattern in their arsenal. These hats are all super simple to make and won’t eat up a lot of your time, so you can be wearing a super stylish hat in no time! Although scarves and hats can be lots of fun to make, every knitter knows that there’s only so many scarves and hats one can have in their wardrobe. Once you’ve got a ridiculous amount of scarves and hats, to the point where you could never even possibly wear them all in a winter, you know it’s time to venture into other arenas of knitting. Here are some of our favorite easy knitting patterns that cover everything from baby booties to washcloths. These patterns are all still super easy and lightning fast. What’s your favorite type of project to knit? Have you ever knit a dishcloth? 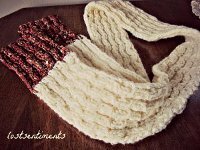 They are one of the quickest and easiest things to knit and they make perfect gifts. Today I bring to you not one, not two, but nine knit dishcloth patterns all in different stitches! Learn how to knit a dishcloth in nine different stitches and you’ll be able to see which stitch is your favorite. I personally love them all! It all depends on your skill level, but you can work through each dishcloth knitting pattern and decide for yourself. Like I said, these are quick knitting projects that are perfect for beginners! Some people say that this pattern is the only pattern they use for dishcloths! Garter Stitch knitting is easy and this pattern is perfect for those who want to learn how to knit the garter stitch. This dishcloth is super fast and easy knitting pattern. The slip stitch is a neat way to create texture. Stockinette stitch knitting is a neat and tidy stitch that will help you practice you knits and purls. This knit dishcloth pattern is a great way to step up your knitting skills. Knit seed stitch is the best way to create the ultimate texture for a dishcloth. Great for scrubbing! 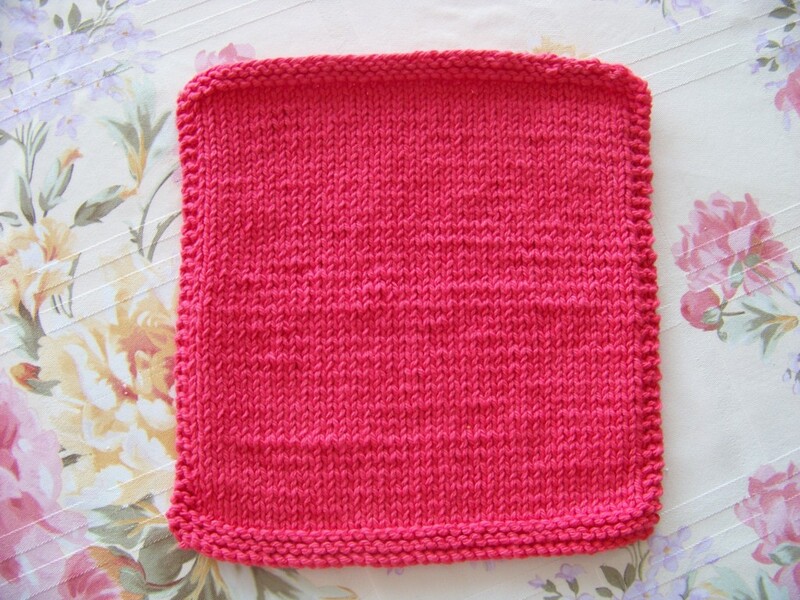 After you learn the how to seed stitch, double the fun with this knit dishcloth pattern. This knit technique lets you switch from knit to purl to create the basketweave effect. The moss stitch is another wonderfully textured stitch. 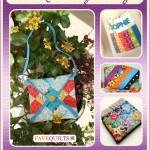 Create this fun texture with an easy-to-memorize pattern. 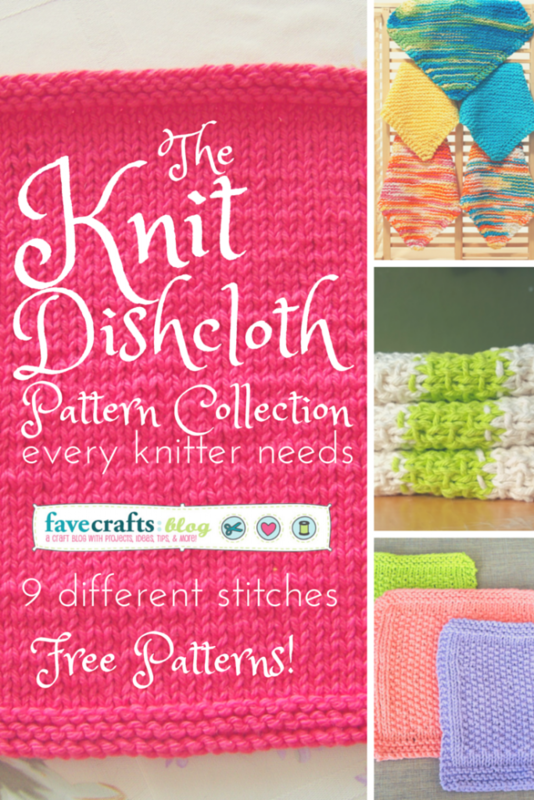 Which knitted dishcloth pattern do you want to try? These free dishcloth knitting patterns are varied and unique – you won’t find two patterns that look anywhere near the same. 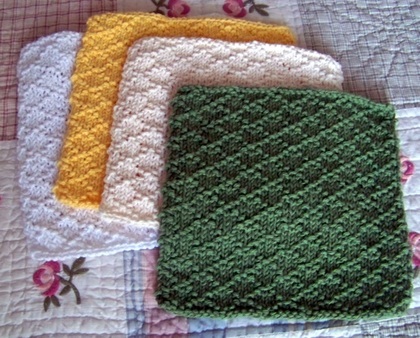 Dishcloths are a great option for beginning knitters or anyone who wants to make something in one night. 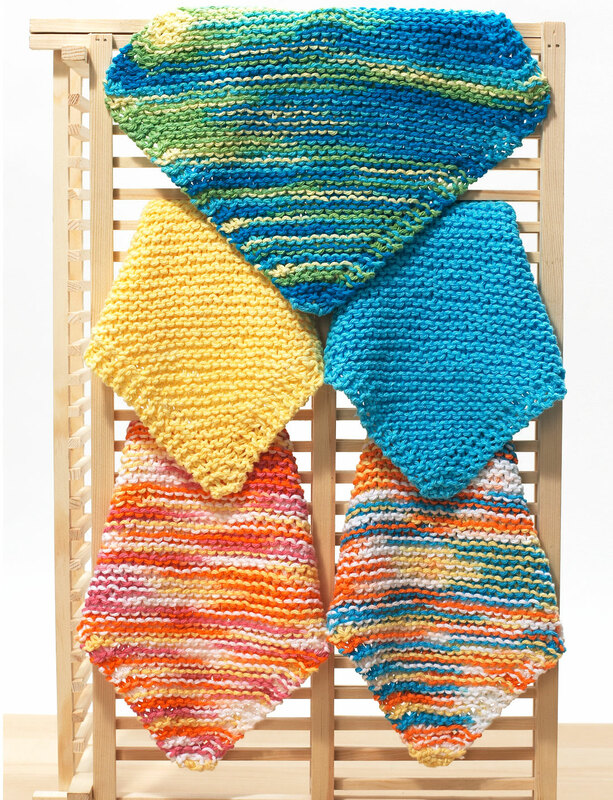 Often, these projects only require one skein of yarn, so you can make a dishcloth anywhere. 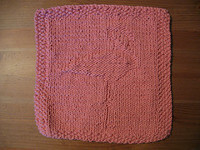 Follow AllFreeKnitting’s board Knit Dishcloth Patterns on Pinterest. Now that I live on my own and have my very own kitchen, I know one thing for sure: everything costs money. When I was a kid, items would just magically appear, I would use them and that would be that. But now, I have so many responsibilities, including keeping my kitchen clean and stocked with necessary items. One thing I never thought about growing up was dishcloths. Now that I’m older, I know just how important it is to have a good sturdy dishcloth that you can reuse over and over again. After all, paper towels are costly and wasteful! 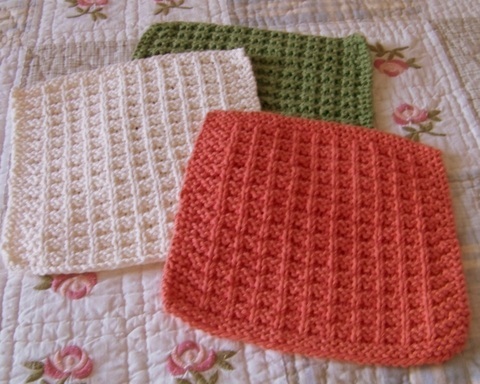 Thankfully, FaveCrafts has a bunch of knit dishcloth pattern ideas that I can use whenever I want. Instead of buying some boring old dishcloth, grab a pair of needles and work up a quick dishcloth that matches your decor. 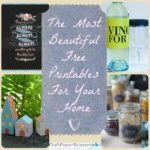 These are great projects to work on while you watch TV or sit in a waiting room. 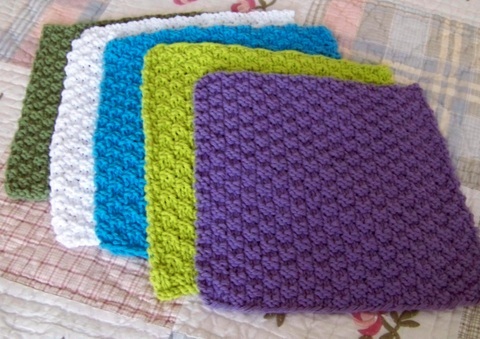 Best of all, dishcloths are perfect starter project for a beginner. Choose yarns that stand out and make a statement. Who knows – you may actually WANT to do the dishes from now on. Pink Flamingo Dishcloth – How have I lived without this knitted dishcloth pattern? 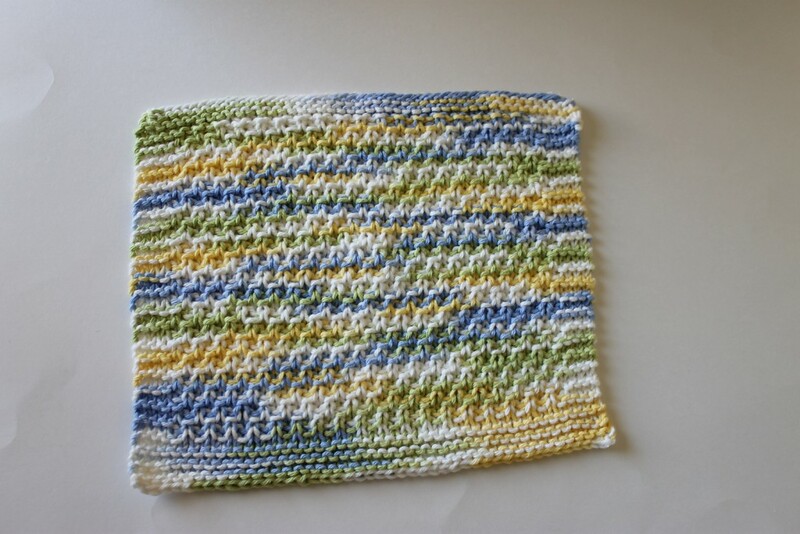 Cotton Stripes Knit Dishcloth – Super simple but so adorable. I want one in every color. 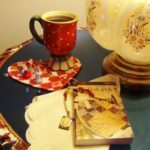 Doily Style Dishcloth – Add a vintage flair to your kitchen – it’s so easy. Ridged or Waffle Dishcloth – Waffles aren’t just meant for breakfast. 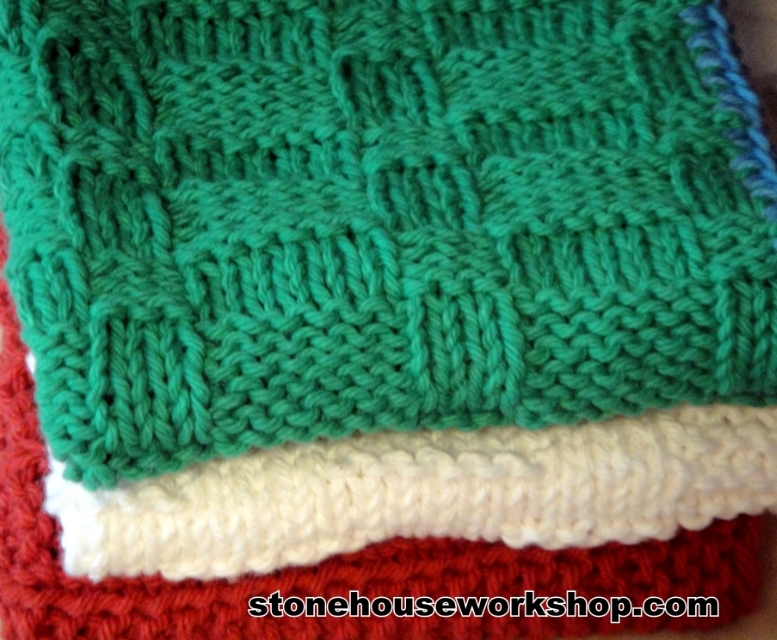 Mitered Knit Dishcloth – This is a new take on an old favorite knit dishcloth pattern. But What If You Need A Basic Knit Dishcloth Pattern? Easy Dishcloth Knitting Pattern – My new favorite free knitting pattern. 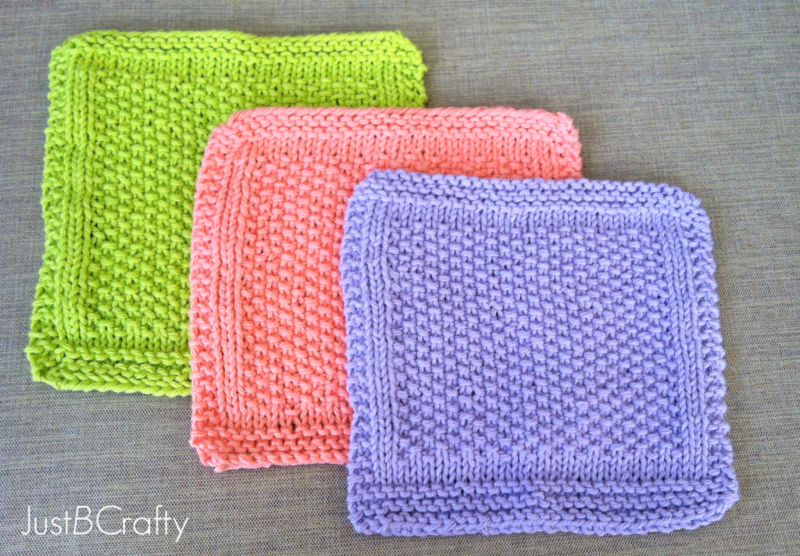 Simple Dishcloths – A quick project you can work on tonight. 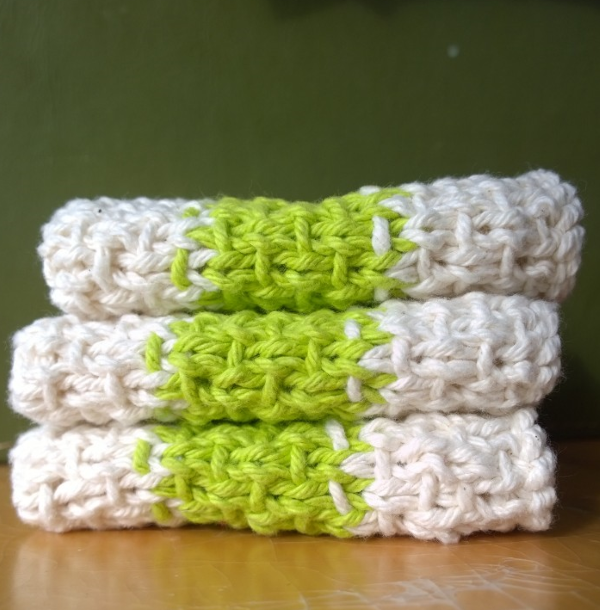 Nifty Knitted Dishcloth – How great is this knit dishcloth pattern? Easy Knit Dishcloth – I think I’ll make one of these for my mom. Feathered Dishcloth – Girly, fun and too cute for words! Tulip Dishcloth – Whether it’s spring or the dead of winter, you’ll appreciate this pattern. 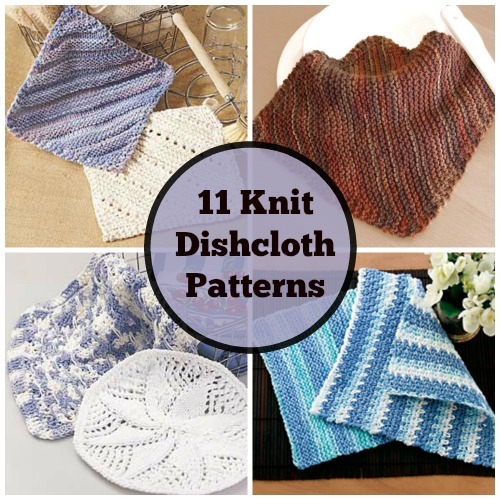 Don’t stop with dishcloths! 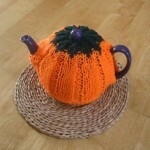 Make knit mug cozies, coasters and more with a little help from 12 Free Knitting Patterns for the Kitchen. The kitchen is the most important room of the house, so make sure it looks great and feels comfortable. 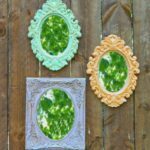 If you have a pair of needles and some yarn to spare, you can make these amazing projects. 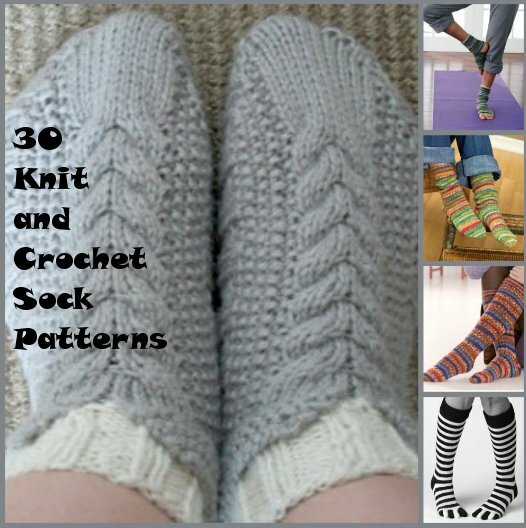 Keep your toes nice and warm with these fun and cozy knit and crochet sock patterns. With warm socks to cover the feet of everyone in your family, this collection is perfect if you’re looking for something fun to make this weekend. Making your own socks is a fun way to use up extra yarn in your stash…and handmade socks make great gift ideas for everyone on your list. 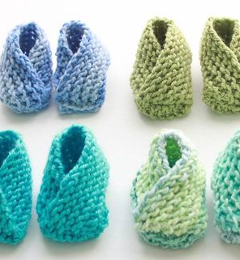 From tiny baby feet to daddy’s feet, these knit and crocheted sock patterns will make it easy for you to make all kinds of meaningful gifts for family and friends. Looking for even MORE awesome knit sock patterns? Be sure to enter our giveaway! We’re giving away a copy of Creative Effects in Sock Knitting to one lucky winner! Scroll on down for all the info on how you can win! BONUS! We’re giving away a copy of Creative Effects in Sock Knitting: Op Art Socks. Filled with amazing knit sock patterns, this book will give you tons of fun and colorful ways to keep your feet nice and warm! You have until March 14th to win, and you can enter to win once a day…so the more you return, the greater your chances of winning this awesome book! Visit the Creative Effects in Sock Knitting book giveaway page to enter to win today! Like free stuff? Be sure to enter our other weekly giveaways, going on now! 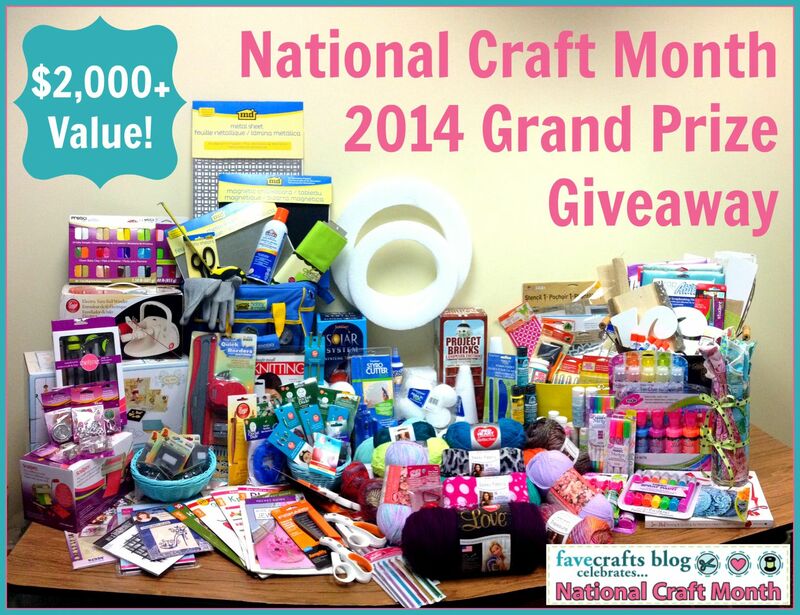 And don’t forget to enter to win our amazing $2,000 National Craft Month Grand Prize Giveaway! These aren’t your grandma’s patterns. Made with colorful yarns and incorporating fun patterns and designs, these classic knits have been given a modern twist…making them perfect for the chic urban knitter. From the classic cabled hat to the more modern arm warmers, these knitting patterns will have you ready for a cold winter in the city in no time! 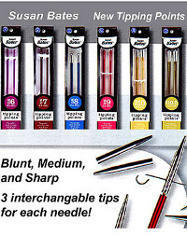 Are you new to knitting? Well then you’re going to love this Slouchy Cowl. With a simple stitch repeated over and over, this cozy winter accessory is great for keeping you nice and warm as you walk to the train or the bus. 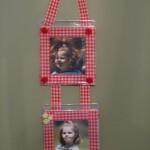 You can even make one in all your favorite colors so you always have a fun accessory to liven up your outfit. More advanced knitters can try their hands at knitting up these Wicked Knit Mittens. With a beautiful knitting pattern, these cozy mittens will be all the rage when you wear them out to do your holiday window shopping. 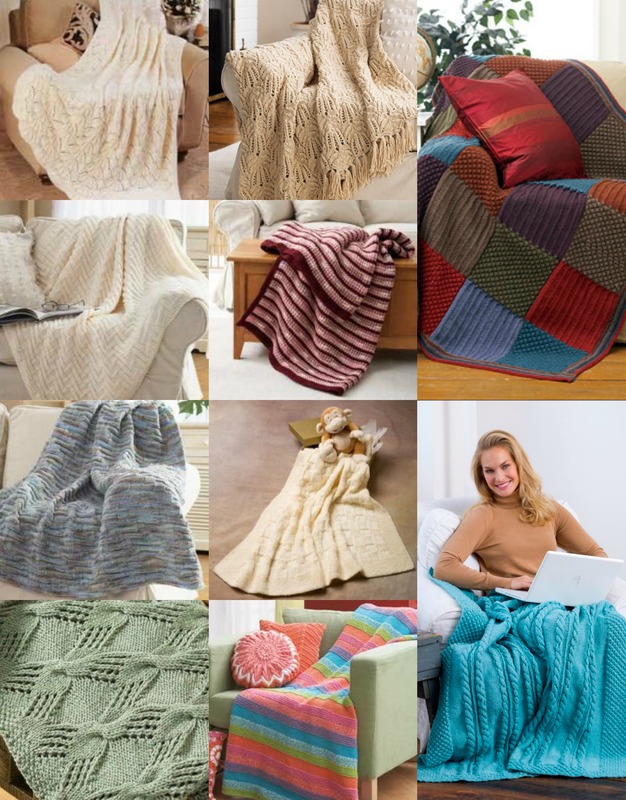 Find even more cozy knit patterns below! BONUS! 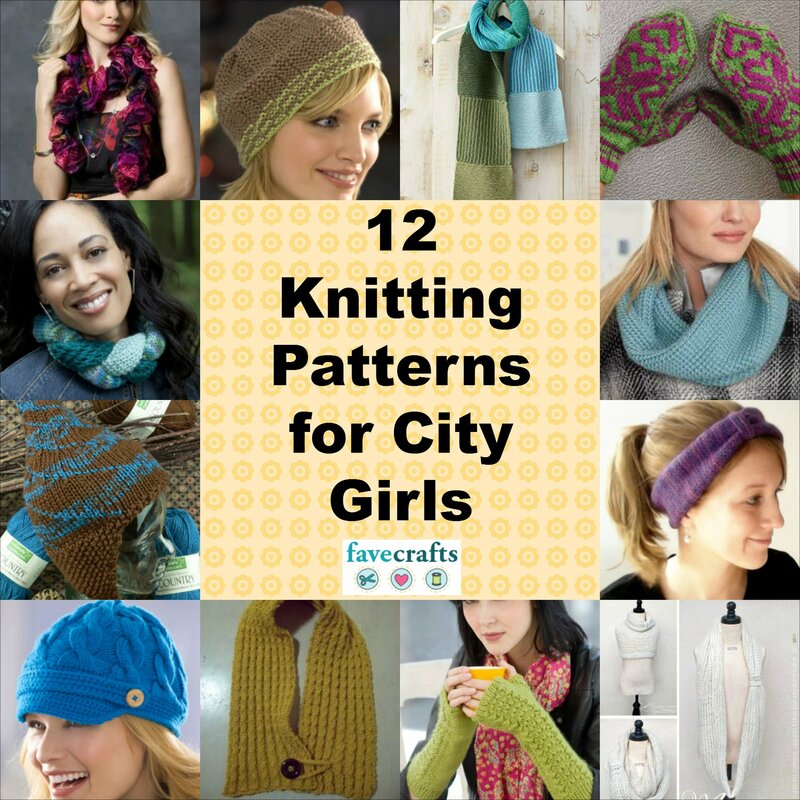 We’re also giving away a book that city knitters are sure to love! Scroll on down to find out more! Bonus! 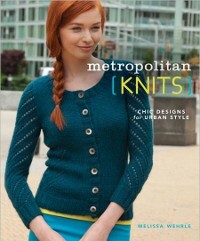 We’re giving away a copy of Metropolitan Knits, a book that gives you chic designs for your urban lifestyle! 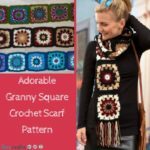 With 20 patterns to choose from, this book has fashionable and fun projects to help you update your winter wardrobe. The giveaway ends October 25th, so head on over to the giveaway page today and register to win! What knitting project are you working on right now? Tell us about it in the comments below!